My pilot review of the series highlighted that for me it was quite a personal show, being set somewhere I’d grown up. After watching the whole series though, and leaving it a few weeks until writing this review, I can be a little more objective about the whole thing, which unfortunately means being rather more critical. I think it’s probably entirely intentional by the writers, that the largest joke of the series, that almost nothing happens. I mean I know it was just six, half hour episodes which gives a runtime comparable to your average film, but even so there’s very little going on. Laid back and gentle is one thing, but I think this took it a little too far, particularly given the somewhat unsatisfying ending. The humour meanwhile was a mix of really lovely observational comedy and painfully overused repetition. The subtle stuff was great and made me laugh out loud – little knowing smiles behind someone’s back, gently winding up friends and family, or fun misunderstandings between the locals and the out-of-towners. But it was partnered with really irritating running-jokes, things like Carol saying “talk of the devil” every time anyone arrived, or the echoing “laters” when they leave. The characters though were believable and interesting, even the more outlandish Chloe and Kieran (I’ve never seen a living statue in Weston, although I guess there likely will be next year) didn’t get too much because their relationships with Sarah made them feel more real – if she liked them, then I was willing to give them a chance. John and Richard meanwhile balanced each other perfectly, both of them bringing out sides of Sarah and neither of them entirely right, nor entirely wrong for her. I very much liked the way their relationships grew, particularly the careful writing that meant it never felt like they stopped when the cameras stopped. The other thing that stuck with me from the pilot was just how beautifully shot it was. They made the very best use of all the different parts of Weston and clearly sacrificed something to the weather gods so that the sun shined down and it looked lovely. (In contrast I was at the very location of the Cafe over Christmas and it was blowing a gale, bucketing it down and extremely miserable). 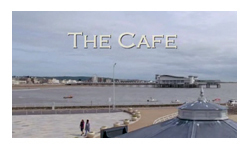 In the end it didn’t really matter about whether it was funny or a great plot or any of that, because I have such an appreciation for the way the writers have so perfectly captured the Weston-Super-Mare that I know. My biggest complaint about the whole thing is probably the repetitious stuff, just because it made it gave away that it was a scripted comedy, not a show made just for me, my brother, and maybe a few dozen other people.